Jim Payne MIPAV TRV MCEI presents this turn key 3 bed semi found in the established neighbourhood of Woodview overlooking a public green area. Number 22 is in turn-key condition throughout and has been totally renovated/modernised in recent years to include new kitchen, bathrooms, windows, full rewire, condenser boiler, internal walls re insulated to 60mm level. Accommodation includes hallway, living room to front, open plan kitchen come dining area to rear. Upstairs three bedrooms plus recently fitted family bathroom, to rear walled garden plus block shed, to front off-street parking overlooking a public green area. 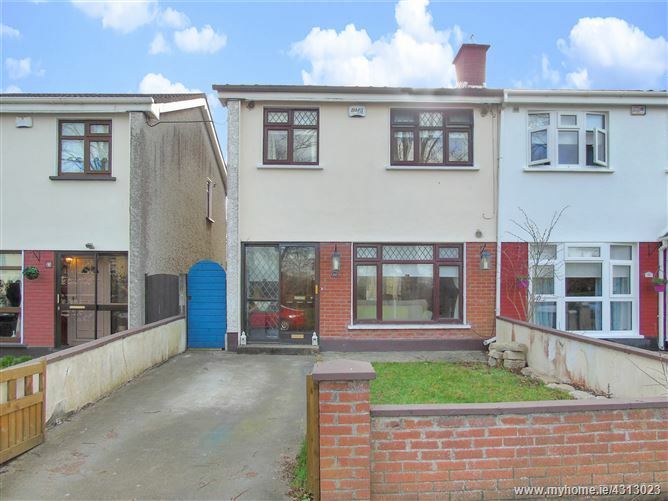 Minutes' walk to national schools, local parks, Tesco Shopping Center, Lucan Village, public transport & Adamstown train station. N4/M4/M50/M7 all within an easy commute. 22 Woodview Heights is sure to impress - early viewings recommended. Hallway: 3.87 x 1.76. coving, centre rose, under stairs storage, laminate wooden floors, phone, point, alarm panel. Sitting room: 4.22 x 3.35. coving, centre rose, feature fireplace, laminate wooden floors. Kitchen/dining: 3.56 x 5.25. coving, centre rose, high quality fitted kitchen, island unit, wine rack, integrated fridge freezer, tiled splash back area, ceramic floor tiles, French doors leading to rear garden. Landing: hot press with immersion and shelving, carpet. Bedroom 2: 3.34 x 3.26. coving, centre rose, fitted wardrobes, laminate wooden floors. Bedroom 3: 2.75 x 2.39. coving, centre rose, fitted wardrobes, laminate wooden floors. Bathroom: 2.05 x 1.99. WC, WHB, Triton T90xr electric power shower, walls fully tiled, ceramic floor tiling.